Leaf-mine: An egg is deposited in the centre of the rosette. The larva makes untidy, winding and crossing corridors. When a leaf that has been eaten out it is left through an opening, and a new one is entered. Up to five leaves can be mined out in this way; they turn brown and shrivel. Pupation is outside the mine, in the ground (Bladmineerders van Europa). The mine is ilustrated in British Leafminers. Larva: The larvae of flies are leg-less maggots without a head capsule (see examples). They never have thoracic or abdominal legs. They do not have chewing mouthparts, although they do have a characteristic cephalo-pharyngeal skeleton (see examples), usually visible internally through the body wall. The larva is ilustrated in British Leafminers. Larvae in two generations (d'Aguilar & Coutin, 1988). Hibernation as puparium in the ground. (Bladmineerders van Europa). Comments: d'Aguilar & Coutin mention Geum montanum, Solidago virgaurea and Tussilago farfara as hosts of this species; no source is given (Bladmineerders van Europa). Time of year - mines: June and August (Bladmineerders van Europa). Time of year - adults: June and again in August/September and with adults flying in May and July (Hoverfly recording Scheme). Distribution in Great Britain and Ireland: The host plants are alpine in their natural habitat, but have been cultivated for a very long time, growing on roofs and walls and often planted in rock gardens and, more recently, as patio plants. 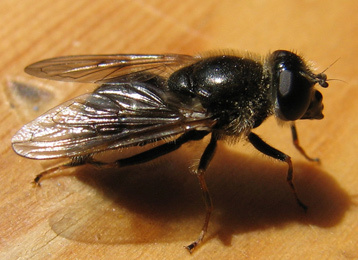 The hoverfly has spread north and west across Europe and its arrival in Britain has been expected. For example, it was first found in the Netherlands in 1986, but by 2005 it was reported to be widespread and common in urban gardens in Leiden. An adult female was found by Graham Collins in his garden in South Croydon (Surrey) in May 2006 but was not immediately identified. In 2008 Andrew Halstead noticed that houseleeks in his garden near Woking, Surrey were in poor condition and found that the leaves were being attacked by a hoverfly larvae. Some were sent to the Central Science Lab and 4 male and a female reared. These were identified by Nigel Wyatt at the Natural History Museum. A check on plants at the RHS garden in Wisley, Surrey in June this year also showed that some of these were mined. Given the experience in Belgium and Holland, we can expect this species to spread rapidly and become widespread in gardens (Hoverfly recording Scheme); West Suffolk (NBN Atlas). Distribution elsewhere: Widespread in continental Europe including Austria, Belgium, Czech Republic, French mainland, Germany, Hungary, Italian mainland, Poland, Romania, Slovakia, Spanish mainland, Switzerland and Yugoslavia (Fauna Europaea).